i don’t know why i did it this morning. maybe ’cause i woke up in a good mood, from having a good night. maybe it was all that great inspiration i felt last night. maybe i thought i could handle anything thrown my way…’cause i am wonder woman don’t you know. all i know is i haven’t done it since January…. and back then it made me feel great…made me feel awesomely amazing. a little pissed right off. i went on the scale today. I am three pounds heavier than i was in January. if you feel the need to laugh at me like my lovely friend did… please don’t! that’s 3 more pounds i have to contend with. wasn’t it just the other day i mentioned that weight loss was no longer a focus of mine? i was warned at the gym…well not warned…but i was told that once i started working out with weights i would gain weight…but it would be muscle. i get that. i get that it’s a possibility. apparently i am a liar cause this has obviously freaked.me.out. ya know…my yogurt…that sinful, tasty sweet and salty popcorn? is it possible that it’s the forbidden FAT? i mean honestly…how would you know? how could you know if it was muscle or fat? i don’t feel any different. my clothes are not fitting tighter…on most days i feel ok with where i am…unless my hormones are at play. i told you. nothing good ever came out of the scale. i would have been better off living in my own bubble. my own little world…where scales never existed. i don’t know why the hell i did that! 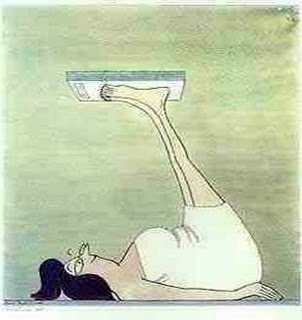 this is how i am going to weigh myself from now on! This entry was posted in health, journal, weight loss and tagged blog, blogging, fat, feelings, goals, gym, health, humour, journal, life, low carb, muscle, personal, scale, stress, thinking, weighing, weight, weight gain, weight loss, working out, writing on May 19, 2011 by losing bee. Wait, that’s NOT how you’re supposed to weigh yourself? !